Low-cost alternatives to interposers could have a big impact on chip design. Lower-cost packaging options and interconnects are either under development or just being commercialized, all of which could have a significant impact on the economics of advanced packaging. By far, the most cited reason why companies don’t adopt advanced packaging is cost. Currently, silicon interposers add about $30 to the price of a medium-sized die, according to several industry sources. For large chips, where multiple reticles need to be stitched together, that price can increase to more than $100. This has limited interposers to high-performance applications such as high-speed networking and server chips, where price is less of an issue. For those applications, 2.5D has proven to be a competitive necessity because it provides a significant boost in performance. An interposer can include thousands of through-silicon vias, which collectively provide fast signal throughput even though the individual TSVs are not as fast as other high-speed interconnects. In conjunction with that, different chips such as memory and logic can be placed closer together than blocks on a single chip, further enhancing performance and lessening the amount of energy required to drive signals. But an interposer isn’t the only path forward, and silicon isn’t the only material under development. There are multiple types of interposers in research, including organic materials and glass, both of which are less expensive options. And there are scaled down bridges being developed at a fraction of the price of an interposer, although exactly how much these will cost isn’t clear. So far, only Intel has a commercially available bridge, and the company doesn’t break out that price separately. Behind the scenes there is a frenzy of activity involving advanced packaging. This includes universities, chip companies such as Qualcomm, AMD and HiSilicon, foundries such as GlobalFoundries, TSMC, UMC and Samsung, and at all of the major OSATs. There is work happening throughout the semiconductor ecosystem, as well, from EDA tools to manufacturing equipment and test. That will change as more interconnect options emerge from R&D. 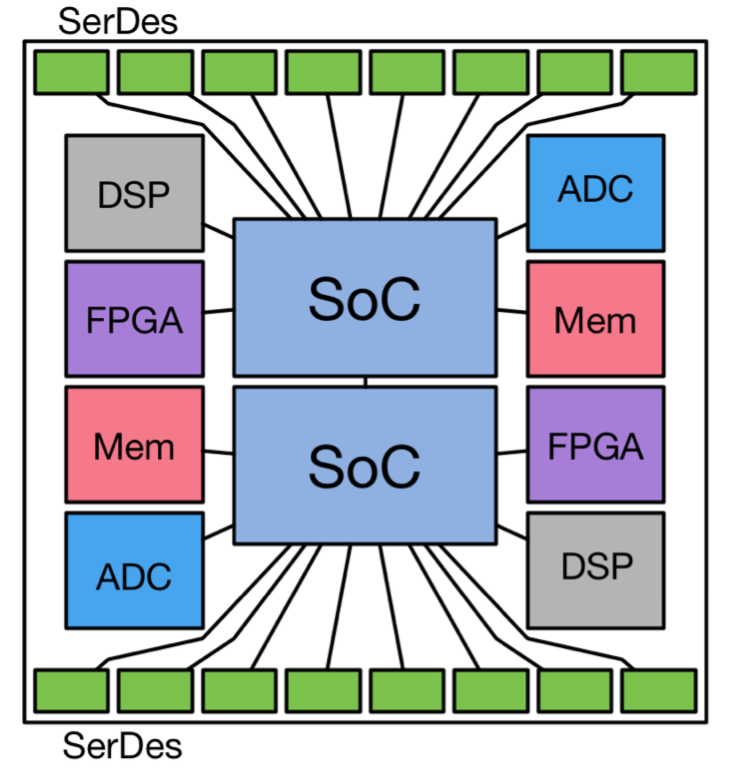 One approach that is seeing a resurgence involves multi-chip modules, a packaging approach that has been around since the 1980s, when MCMs were used in mainframe computers. The advantage of an MCM is that it provides the same kind of flexibility as a PCB, but in a smaller form factor, and it provides a comparatively inexpensive platform for adding in high-speed interfaces. The USR Alliance, started by Marvell and Kandou Bus, refers to MCMs as the new PCB, and it is developing an ecosystem of interoperable components. USR stands for ultra-short reach links, which typically are 2.5cm or less. Marvell, for its part, has been exploring a number of packaging options since it introduced its MoChi (modular chip) architecture in 2015. The initial idea behind MoChi was to pick IP from a menu of Marvell’s technology, which could then be packaged using Marvell’s interconnect. The company has since broadened that out with the USR Alliance, creating a 500 Gbit bi-directional interconnect that can be used to hook together any IP. MCMs and systems in package, which are sometimes described as vertical versions of MCMs, were generally overlooked in the race to put multiple die into a package because those technologies have been around for so many years and failed to live up to their initial promise. But they do add a level of flexibility to packaging, which is valuable in markets where companies want to get products out the door quickly or where specs or user demands change rapidly. MCMs come in different flavors, depending on whether they use ceramic or deposited metal substrate. Systems in package (SiP) were originally supposed to be vertical versions of MCMs, integrating separate die within a package, but the distinction between these two has been blurred over the years as companies introduced MCMs and called them SiPs for marketing reasons. Even some of the fan-out technology is very similar. Even without the interposer, packaging isn’t as simple as initial proponents had suggested. There are costs and issues associated with advanced packaging that are not obvious to chipmakers when they first begin looking at this approach. There are other options that could help with this, as well. 3D multi-chip package-on-package is under development, which could help shave costs off putting everything on the same chip. This approach requires a redistribution layer on one side of a chip, through-package vias, and a redistribution layer on the other side. With RDL first, the RDL is built on a carrier wafer, which is usually glass. From there it is patterned multiple times times to build up the RDL. A mold compound is then added to create a 3D material. That can be repeated for as many layers of RDL as required. The problem with this approach is that it’s not quick. It may take two to three hours to cure each layer, Trichur said. Once the curing is finished, a laser is used to separate the RDL from the glass. This has taken a lot of structural and materials engineering because if the RDL is too rigid it can create mismatches, and if it is too pliant it will not separate easily from the glass. Behind all of this work are several drivers. One is that the benefits of scaling to 7nm and 5nm are becoming harder to realize, and there are fewer companies that are benefiting from that scaling. Even Apple has begun combining the benefits of advanced packaging with the latest process node technology. But as the cost of developing chips continues to rise at each new node, and the potential unit volumes flatten or shrink, it’s becoming harder to justify integrating everything into the same die at the most advanced nodes. Processors will continue to push to the next node for awhile, but even there wires have stopped scaling. Moreover, hardware increasingly is being defined by software, rather than software being developed to take advantage of generic hardware. Systems companies increasingly are using a variety of accelerators geared to specific data types, rather than generic hardware. Some of that data is analog in nature, and analog itself doesn’t scale. As with all packaging, a key issue is yield. Packaging multiple good die together increases the cost of a failure by as many chips as there are in a package. So while the individual die are generally smaller, which improves yield of those die, a failure in any part of the package can affect all of the pieces. This will be particularly important with panel-level packaging, which can offer huge economies of scale if yield is sufficient. But it also requires a number of changes in handling and materials, because like any package it is subject to stress and warpage, as well as a different approach to testing. It’s one that will continue to gain traction, though, because all of these options offer benefits in terms of cost and time to market. But there is an increasing need to view this from a system-level perspective rather than a single die or even a wafer. Advanced packaging already has gone mainstream for some applications, but this is just the beginning. From here, the semiconductor industry will do what it does best—continually reduce costs and improve quality and predictability over time. This will all take time, but given the proliferation of packaging in high-performance devices and the continued demand for more flexible approaches to building heterogeneous systems, momentum continues to build to make all of these different approaches work. Market for advanced packaging begins to diverge based on performance and price. The number of low-density packaging options is increasing as the popularity of advanced packaging grows.